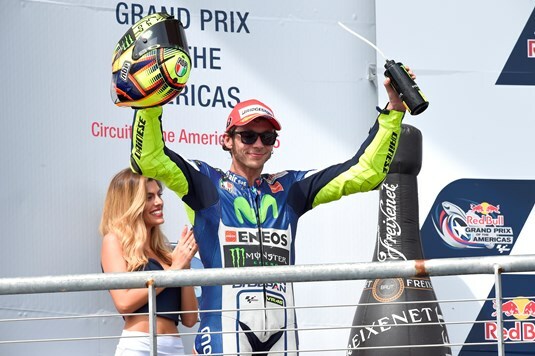 Movistar Yamaha MotoGP rider Valentino Rossi secured a third place today at the Grand Prix of the Americas. Teammate Lorenzo also rode a strong race, despite not feeling at his hundred per cent due to illness, and finished fourth. The weekend at the Circuit of The Americas (COTA) has been full of surprises and the race day was no exception. Though the weather was bright and sunny, the race was delayed at the last minute before the warm-up lap due to water spillage at turn three. The clean up process postponed the proceedings by 37 minutes, but the race remained its original distance of 21 laps. Starting from fourth on the grid, Rossi quickly moved up to third and got involved in a fight for the lead with rivals Marc Marquez and Andrea Dovizioso. Putting pressure on him on lap seven, the Italians swapped places several times in a hard battle for second place before the nine-time World Champion shook off his compatriot one lap later. He then tried to hunt down race leader Marc Marquez, but was unable to close the gap and got wrapped up in a second scrap with Dovizioso, six laps from the end. Rossi dropped back to one place but kept pushing to the maximum. However, a worn out front tyre prevented him from taking his position back. He crossed the finish line in third place, +3.120s from the front, retaining his lead in the championship. Teammate Lorenzo had a perfect launch off the line but got caught up in a cluster of riders when he arrived at the first corner and fell back to fifth place. While fighting to close down the gap to the leading group, he came under pressure by Andrea Iannone. The Spaniard was forced to let him pass, but he didn’t give up. Riding in sixth place, he followed him to the front of the field and soon closed in on Bradley Smith. On the tenth lap he smoothly passed the Brit and continued his stride to the front. He charged up to Iannone with four laps to go and used the nimble YZR-M1 to the fullest with a smooth pass to claim fourth place one lap later. With a 2.705s gap to his teammate, he focused his attention on managing the gap to the rider behind him and held his place to the line, +6.682s behind the leader. Today’s results deliver Rossi 16 points, keeping him at the top of the championship standings with 41 points. Lorenzo increased his point count to 26 in total. He currently holds fifth place in the standings. Bradley Smith produced a memorable ride at the Circuit Of The Americas to claim the honours of being the top satellite rider by seizing 6th place in Texas. The 21 lap race start was delayed due to a spillage caused by a bridge near turn three which caused water to leak on to the track. However, once the surface conditions were resolved, the race began at 14:37 local time. The young British rider leapt off the starting grid from 10th and his impressive start saw him tenaciously cruise around the outside of the pack to jump up to 4th after the first corner, expertly overtaking six riders from the start. Smith remained resolute and set a series of highly competitive and consistent lap times as he remained right in the hunt with the leading pack in 4th place. At the mid point, the Briton was running in 6th with his determination intact and his tireless performance saw him keep the pursuing rider at bay to brilliantly cross the line as the top satellite MotoGP rider and only 10.557 behind the leader. With two rounds complete, Smith is 6th in the championship standings with 18 points as he optimistically looks ahead to the next round, confident of a further strong finish. Meanwhile Pol Espargaro’s promising weekend where he hoped to challenge his teammate as the leading satellite bike was cruelly cut short after falling on the first lap at turn 11 due to Scott Redding crashing into him. The 23 year old started the day competitively in 5th during a wet warm up session with high hopes of riding to a top finish in the race. Nevertheless, the young Spaniard will remain focused and will look to make amends by clinching a top result in Argentina next week. It was a difficult race for the riders of the Athinà Forward Racing team today in the Grand Prix of the Americas on the track in Austin, Texas. Stefan Bradl was forced to retire after a contact with Jack Miller, while Loris Baz crossed the line in 17th position. Bradl, who started from the fourth row, had a good start and was immediately close to the Top10. The German was fighting with Jack Miller to win the lead of the Open class when he fell after a contact with the Australian rookie. Bradl was immediately able to get up, but was unable to rejoin the race and was forced to retire. Complicated race for his teammate Loris Baz who started from the 20th place. The Frenchman struggled at the start, but remained close to the points, before starting to lose grip on the front and crossed the line in 17th position.